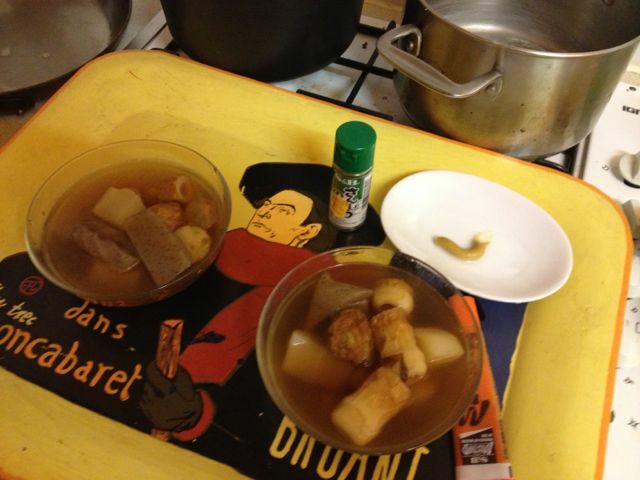 In a perverse attempt to chase away winter, we made the great Japanese comfort dish, oden, this March, coinciding incidentally with predictions of snowfall. It was eaten to the dulcet tones of Stravinsky’s piece. This isn’t something at all found in London restaurants, though Sakana-Tei do have nimono dishes that are not dissimilar. But my favourite oden has always been at Ogawa in Ginza, in the basement of an anonymous office building, quite hard to find and utterly traditional. Businessmen at the counter, not a single gaijin (other than your correspondent), and an occasional young lady in traditional costume, with an elderly companion, with equal probability her father or husband. 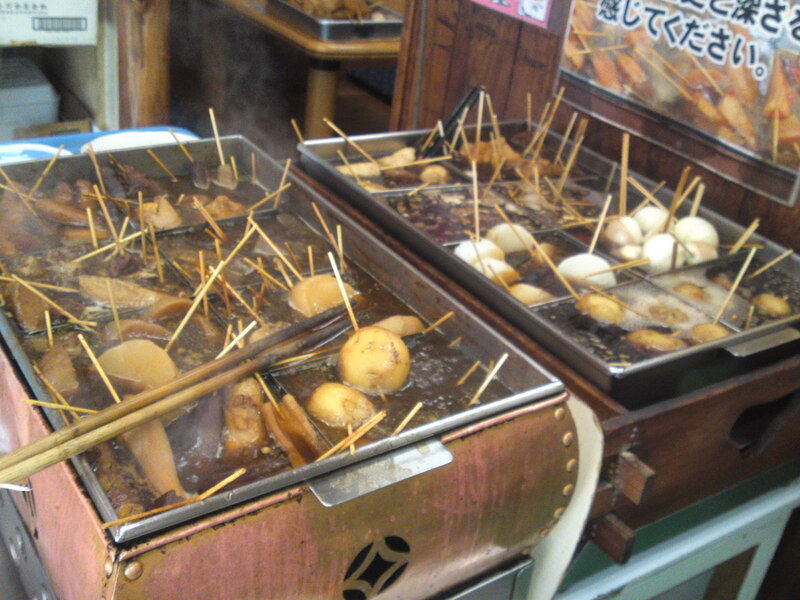 The dish is also traditionally served from a cart, such as at the Senso-ji Temple in Asakusa, Tokyo. 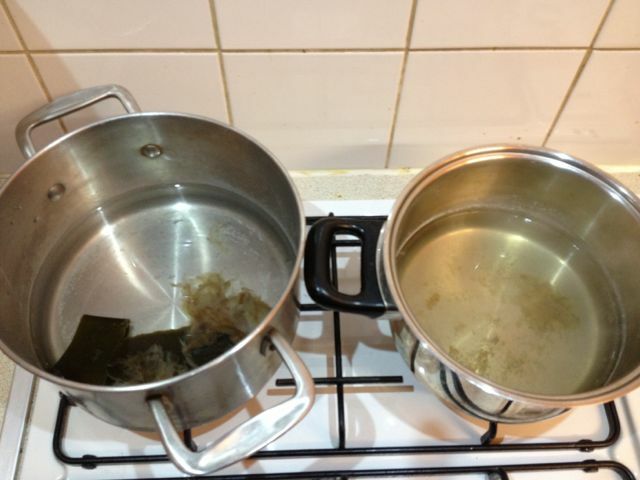 Preparation starts with making dashi , the base stock for many Japanese dishes. 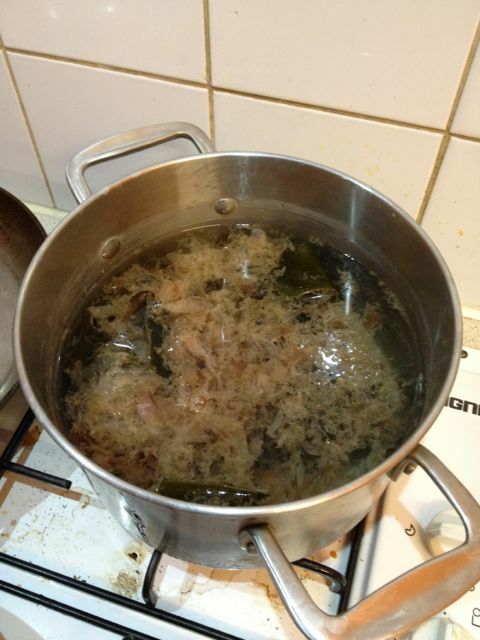 I won’t try to get into the details of preparing dashi, as there are variations for each dish, but in simple terms: the giant sea kelp (kombu) and shaved bonito flakes are simmered (not boiled) in water. 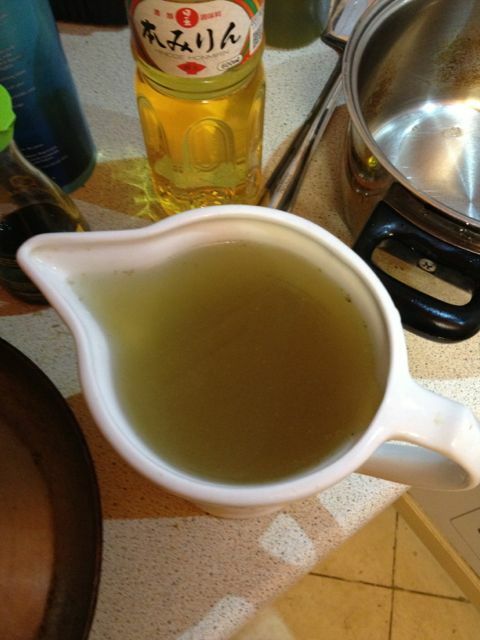 The first pass of the kombu and bonito make a delicate dashi that could be used for soups; the same ingredients are re-used for a second simmering, which gives a stronger, slightly bitter, stock, which is then the base for long-cooked dishes such as oden. 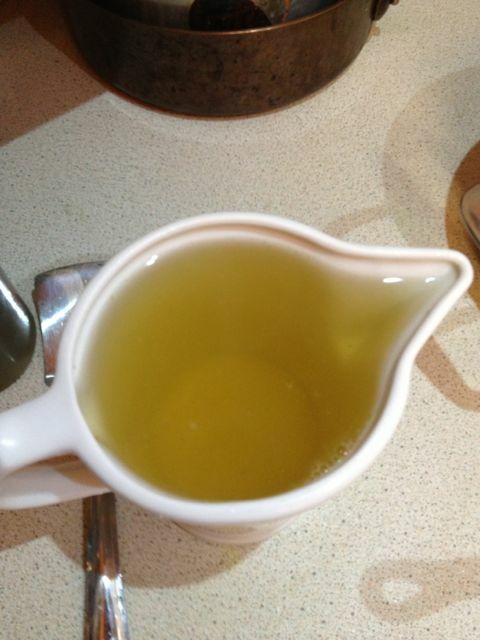 Dashi in the pot – do not boil ! 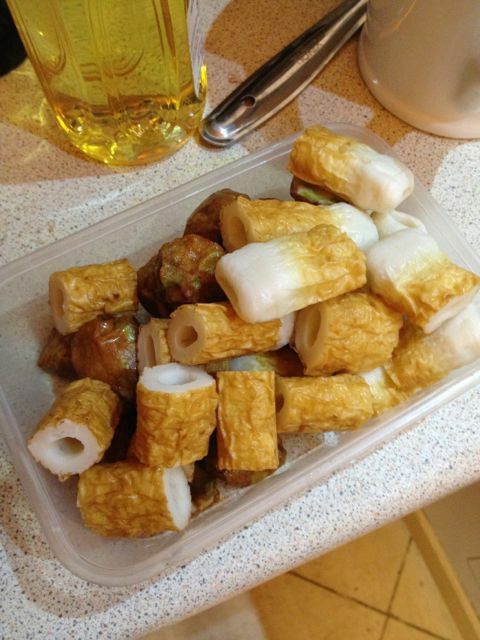 Oden typically has a range of ingredients: daikon radishes, kabocha pumpkins, taro roots, konyaku (evocatively called “devil’s tongue jelly”, made from a yam root and quite gelatinous yet crunchy, like certain clams or jellyfish), tofu (fresh or deep-fried), fish cakes of various types, eggs, and less conventionally, chicken or vegetables. 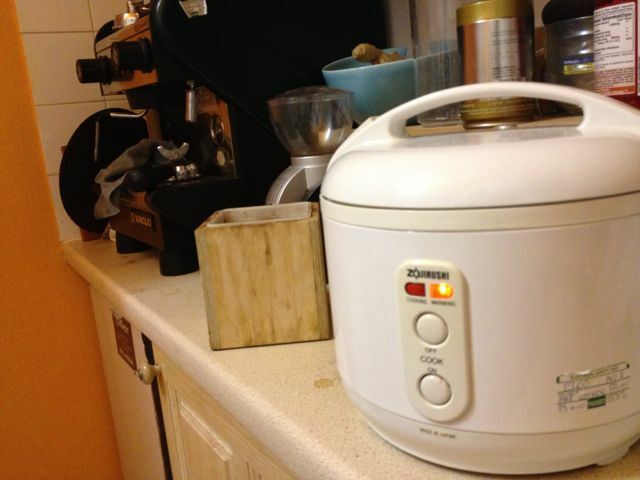 The idea is to have a range of items, that are happy to absorb flavours, and cook them in a well-seasoned broth. 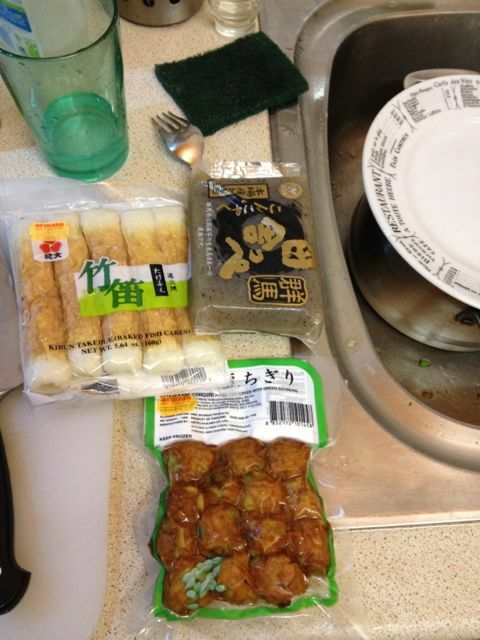 The actual making of the dish is simple (this link is quite good http://norecipes.com/blog/oden-recipe/ ), boil the daikon and the egg, until both are mostly done. Take the second-pass of the dashi, a roughly equal amount of chicken stock, mix it with a little mirin (Japanese rice wine, but slightly sweet), light (usukuchi) soy sauce, and salt, adjusting the ingredients to get the desired flavour, round and rich with umami. Put in the desired ingredients (I used daikon, two types of fish cake, konyaku and a duck’s egg), and simmer on low heat for about 90 minutes until the sauce reduces by 20-30%. 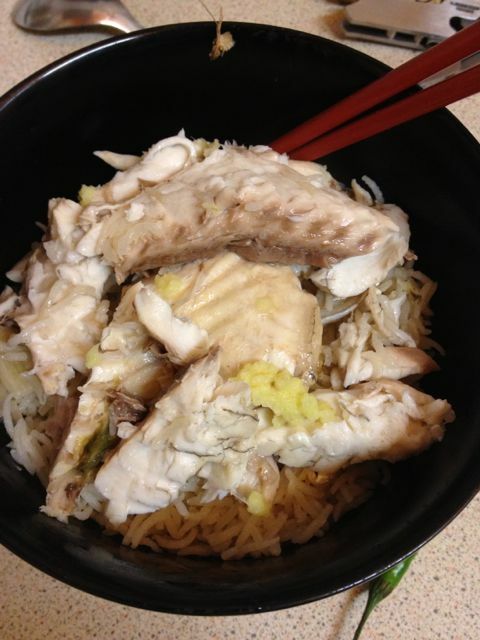 It goes best with Japanese mustard, and shouldn’t really need rice (more of a starter). I’ll find out tomorrow, but they say, like an Italian ragu, this is better on the second day once the flavours have really infused. 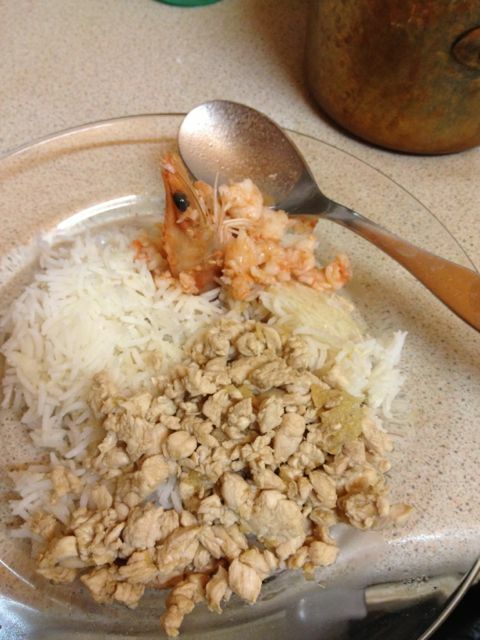 For the main course, I minced some chicken breast and a couple of prawns. I cooked the chicken with a little sake, dark soy sauce and sugar, stirring constantly (there’s no grease, so keep it moving). Once it was cooked through, I set it aside and mixed in some freshly-grated ginger. 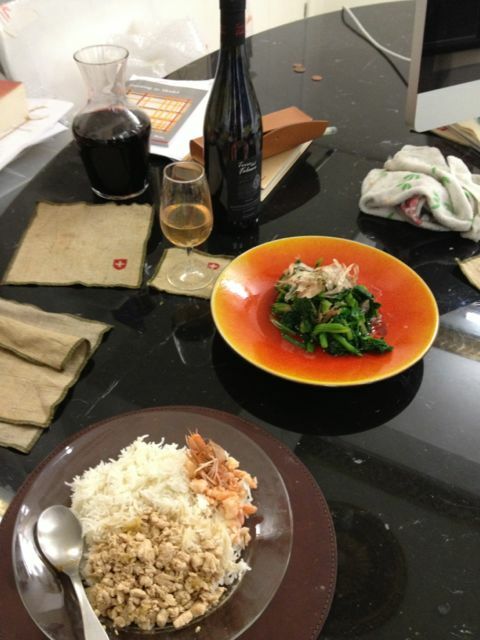 The minced prawns were cooked with sake, mirin, and salt, until just cooked. 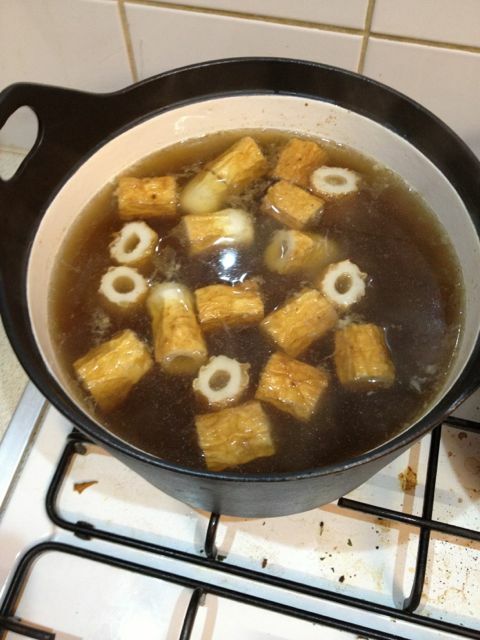 I then use the dashi, mixed with dark soy sauce and sugar, to make a little broth. 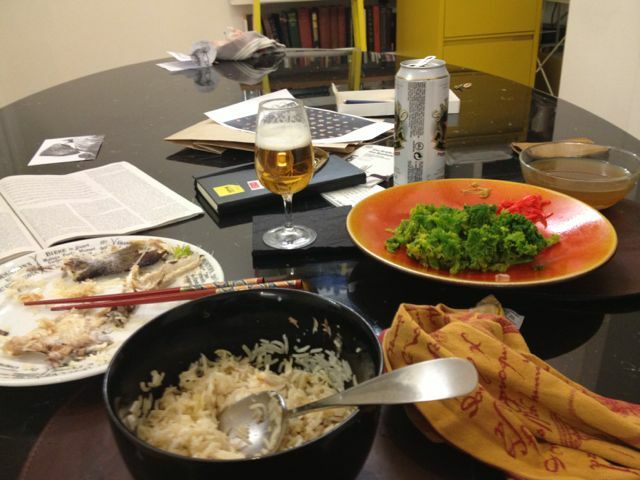 I place the prawns and the chicken on boiled rice, and irrigate with broth. The side vegetable is horenso no ohitashi (soused spinach): lightly boiled greens, in a dressing of dashi, mirin, salt, chilled for a 1-2 hours, with bonito shavings on top. 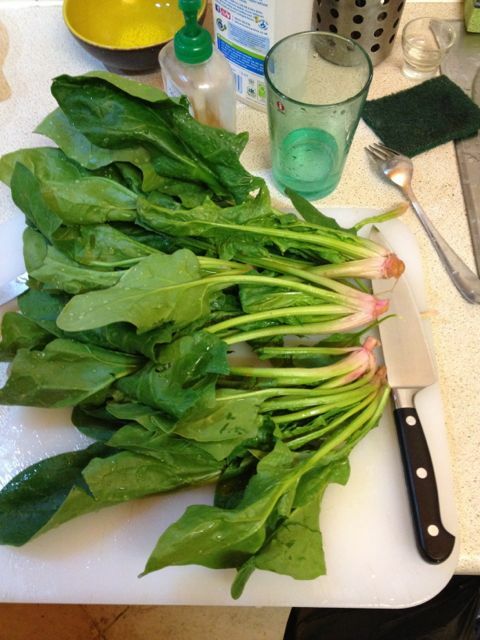 Lovely spinach from hipster heaven – Broadway Market on a Saturday. Dinner. Coasters, incidentally, from a design store in Meguro (Tokyo). CH via JP. 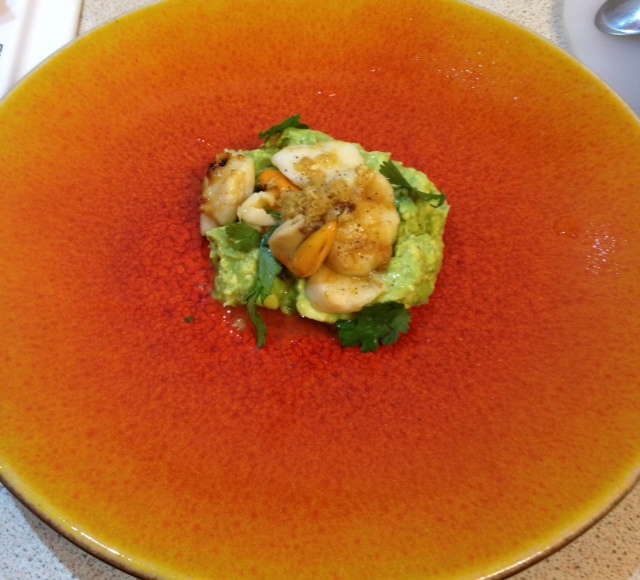 This is a Mediterranean showpiece dish found in elegant fish restaurants in Istanbul, Italy, and London. Most memorably, I’ve had it at Korfez, a lovely place on the Bosphorus’ Asian shore that one gets to by boarding the restaurant’s launch from Bebek pier. Dinner is waterside, just under the towering Fatih Sultan Mehmet bridge, occasionally, punctuated by a passing oil tanker, fully laden from Odessa. Curiously, at night-time, one doesn’t actually see the tanker: it’s the surreal and visceral, felt rather than heard, rumble in the room, and the sudden absence of lights from the opposite shore, as the tanker occludes them. 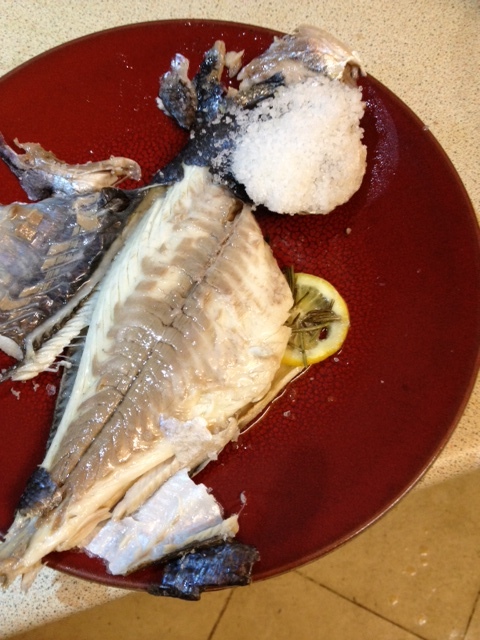 Back to dinner: the fish looks impressive in its salt crust, and cooks beautifully, the salt locking in the moisture and (if successful) only gently penetrating the fish to accentuate its delicate flavour. Most recipes specify sea bass, but I had very decent gilt-head bream (albeit farmed) at the fishmongers, for £7, so not exorbitant. 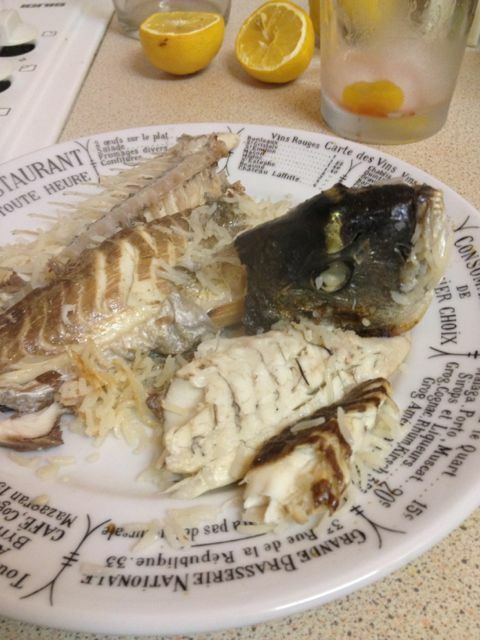 See Rowley Leigh’s article on the topic, but I agree a nice bream probably is better than the average mass-farmed sea bass one sees everywhere. 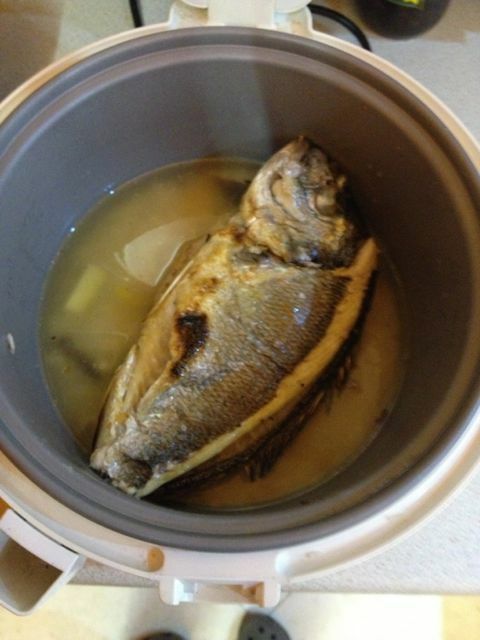 Ask your man to gut the fish, but probably not scale it; I’ve seen recipes that call for scaling and others that don’t, and the result was very good in both cases, but the scaled fish was much saltier. 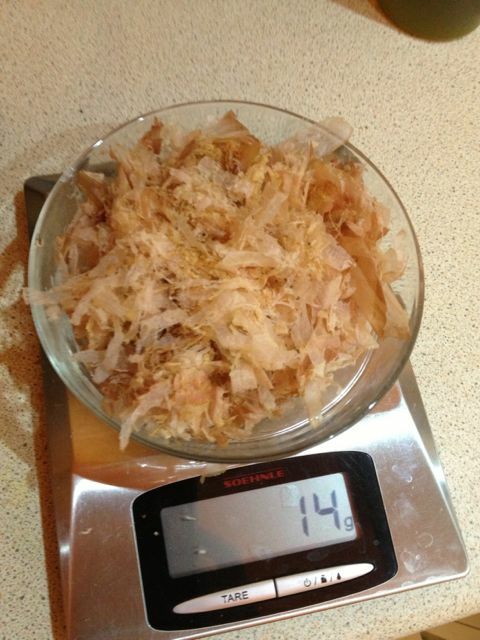 Make sure you have about 1kg of coarse marine salt available. 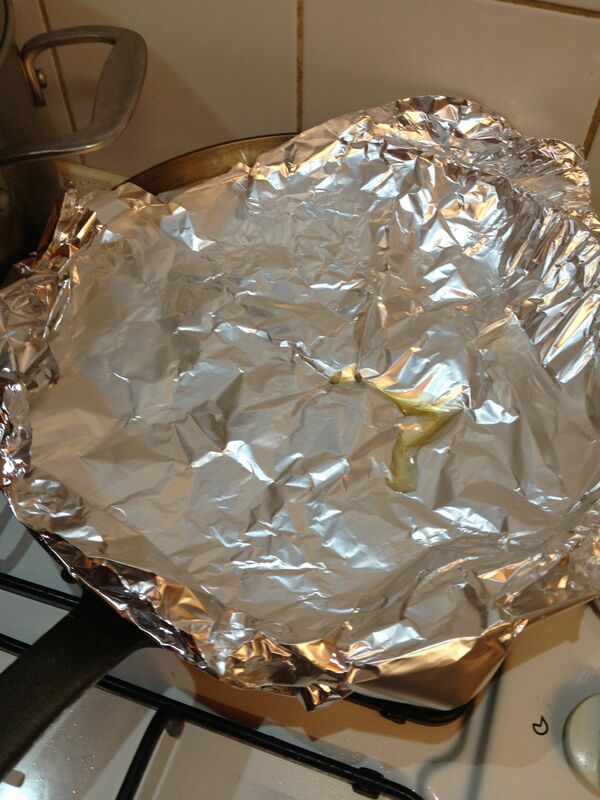 I don’t have one, but you should have a fish roasting pan for this to work properly. Also a fish slice to handle the beast without breaking up. 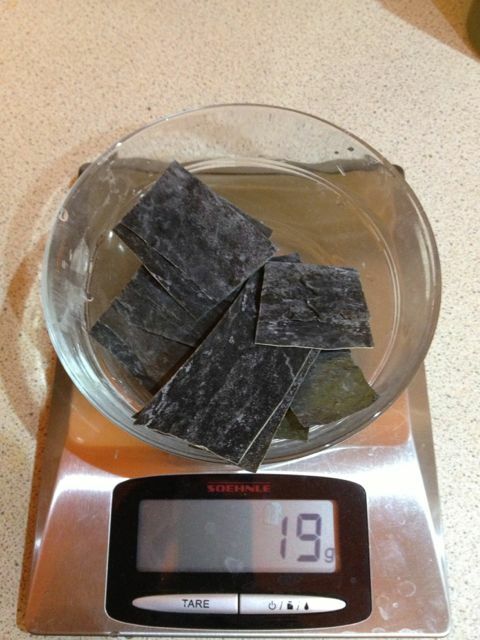 Lay a bed of salt, 1-2cm deep in the pan. 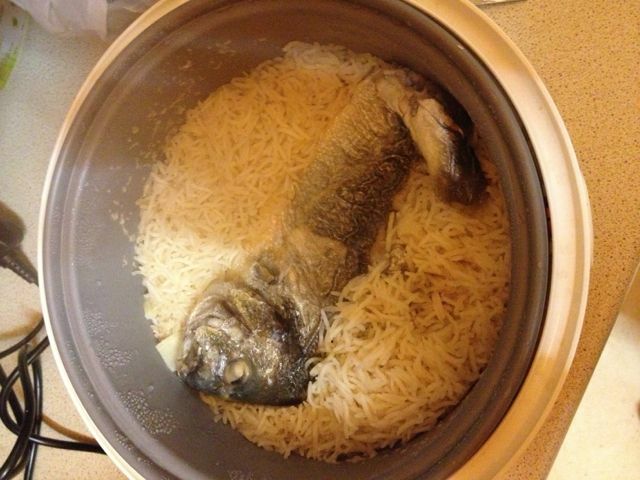 Place the fish carefully on the bed. 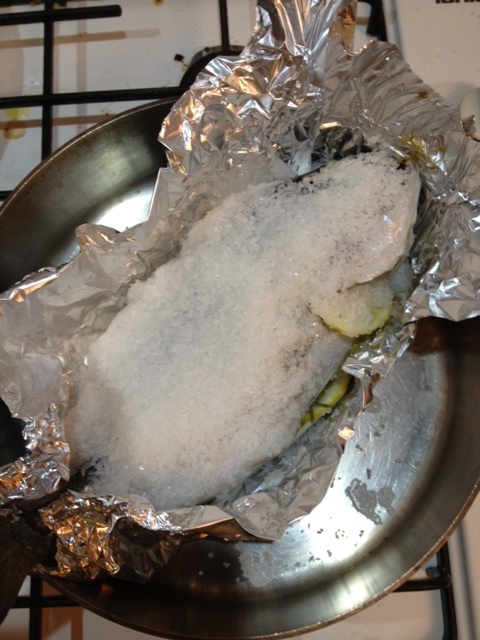 Cover the fish with salt, so no bits are exposed (hence a big pan is helpful – in my case, the head stuck out and so there was a break in the salt crust). Drizzle on a little water and pat the salt down, this helps bind the salt crust. 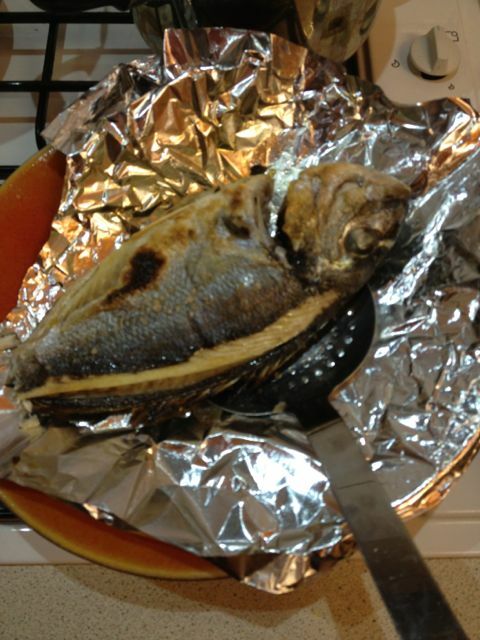 Put in the oven for 20-25 minutes depending on the size of your fish. Bring it out, and gently tap the salt crust with a knife, which should come off in big chunks. 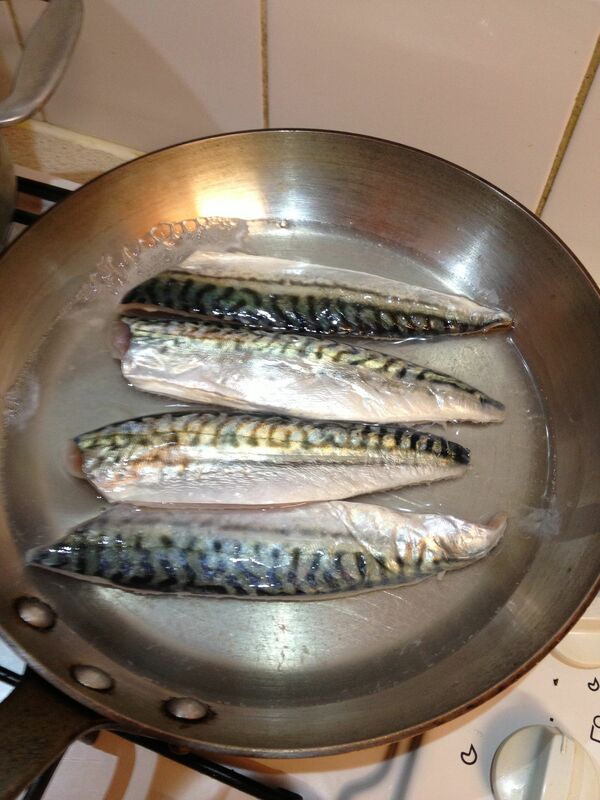 Once the top-side of the fish is exposed, gently lift onto a cutting board or platter. 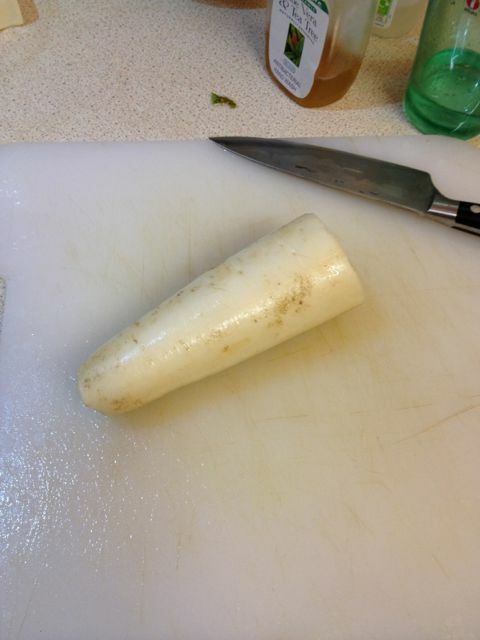 Gently cut back the skin, which should take any stray salt pieces with it. Then lift out the filets and place on warmed serving plates. 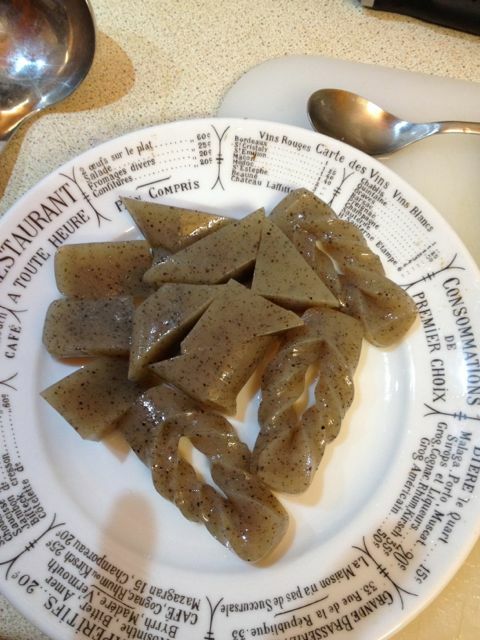 Serve with lemon. I’m not sure pepper or EVOO helps, as the fish + salt has such a great flavour, that olive oil really dominates (or it might be my crap/strong/green Cypriot oil). 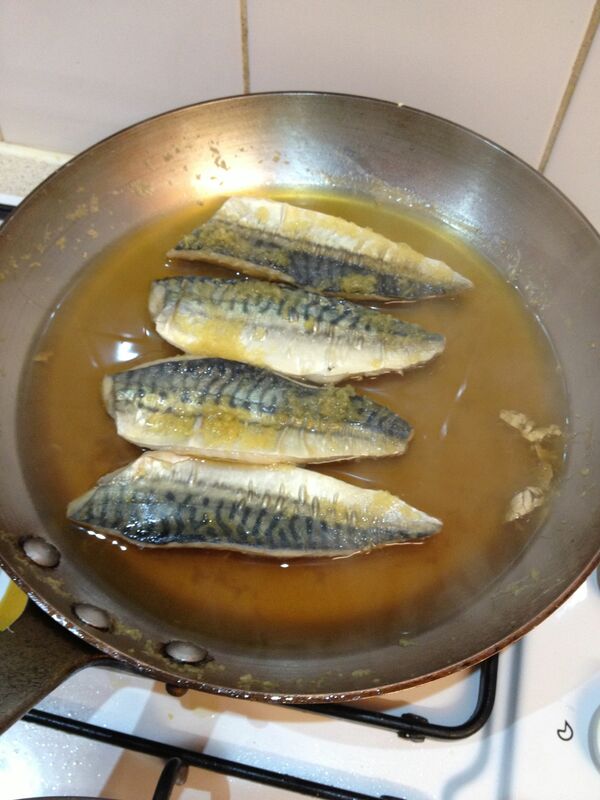 The fish doesn’t really need any seasoning before cooking. Nevertheless various recipes suggest stuffing with thyme or rosemary. 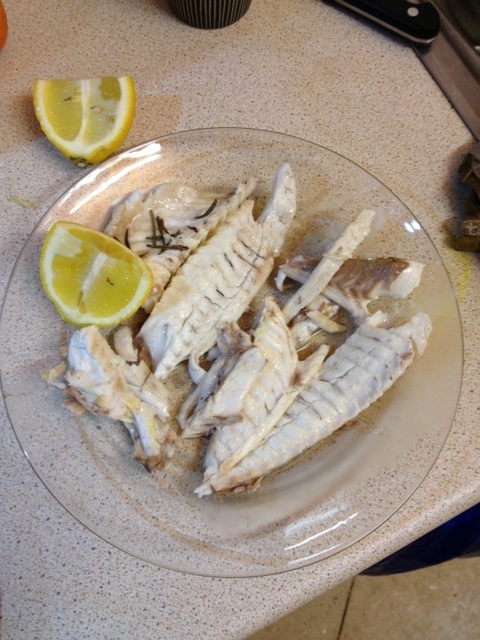 I put in lemon slices and (dried) rosemary, and found the effect unconvincing. Various recipes suggest mixing the coarse salt with a binder, such as egg-whites, which perhaps creates a better crust. Not having tried it, I have no view.